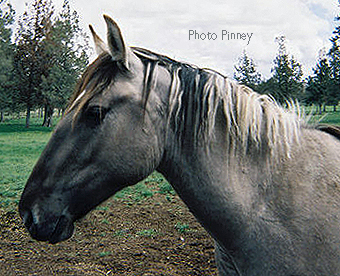 The first Sorraia that went to North America since the days of Columbus was Sovina, a silver grullo Sorraia stallion born in 1999, bred by Hardy Oelke and bought by Erin Gray in Oregon in 2000. Unfortunately, the horse has been gelded. 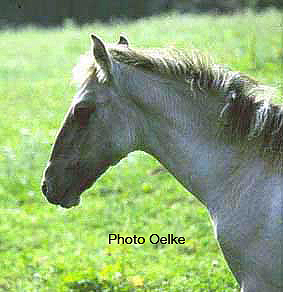 In 2001, another Sorraia colt—a full brother to Sovina – was shipped to Wisconsin. This stallion's name is Tejo II, named after the majestic Portuguese river that dominates the region north of Lisbon called "Ribatejo", which seems to have been a hotbed for the Sorraias' ancestors, the zebros, as is manifested by many field names there. The owner of this Sorraia, Karen Dalke, has been doing research regarding the American mustang's importance and role in the life of today's Americans. Tejo II is a grullo of excellent type and very sweet disposition. His dam is from the old d'Andrade herd at Font'Alva, and his sire was a herd sire there and also at the Portuguese National Stud. Karen also expressed her hopes to acquire some purebred mares in the future. Tejo is broke to ride and may also be driven in the future hitched to her 1903 doctor's buggy. 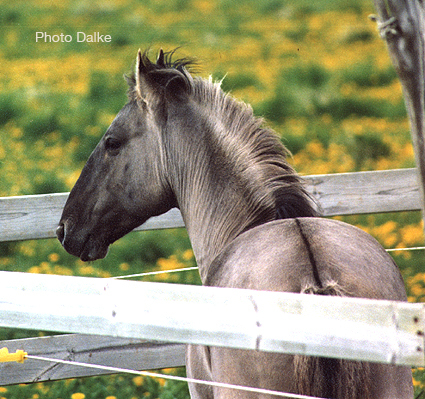 A third Sorraia stallion was shipped to North America in 2006: American Canadians Lynne Gerard and Kevin Droski imported a yearling colt from the zoological park in Springe, Germany. 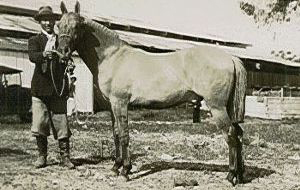 His name is Altamiro, and he was foaled in Springe, where the parks' preservation program was built on foundation stock selected in Portugal. Altamiro, a dark grullo, went to Manitoulin Island, a touristy place in Lake Ontario, Canada, where he joined several Sorraia-like mustang mares to roam free in a horse's paradise of pas-ture, woodland and lakeshore. Lynne Gerard and Kevin Droski want to contribute to the pre-servation effort by building a herd of Sorraia mustangs. "Interest in these horses and their preservation has been remarkable", said Lynne. "The Cana-dians seem to have a heart for animals that are threatened to become extinct." Altamiro is the first Sorraia ever to put hooves on Canadian soil. Gore Bay residents Kevin and his wife Lynne have imported this Sorraia colt to breed to their North American mustang mares that are similar in appearance to the Sorraia horse, and to any Sorraia mares that may be brought to North America. 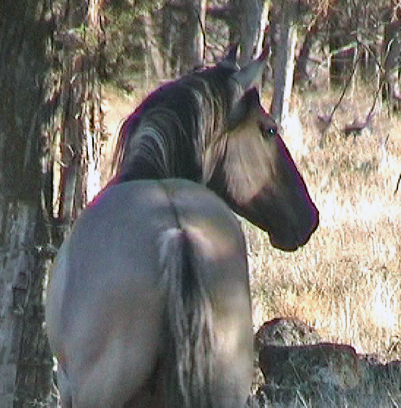 Known as "Sorraia Mustangs", Sorraia-like mustangs are cropping out among mustang herds in North America. 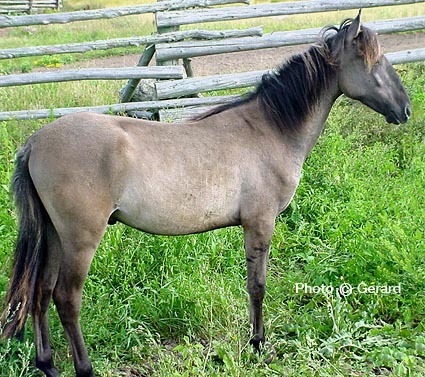 By creating a Sorraia Mustang preserve at Ravenseyrie, Droski and Gerard hope to make a significant contribution to the consolidation of the Sorraia characteristics through select North American mustangs, hopefully even strengthening the gene pool of the Sorraias in the future. "We feel our preserve will benefit the efforts to save the Sorraia as well as bring attention to the special qualities of Sorraia Mustangs," says Lynne. 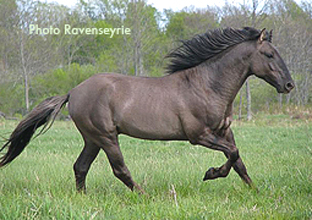 "Ravenseyrie is an excellent natural environment for breeding and raising these rare horses in a semi-wild setting. Kevin and I look forward to recording and sharing data on this project across the ocean and out west." Adds Kevin: "Altamiro‘s offspring here are a marvelous expression of many of the most desirable attributes of the Sorraia. They prove to be tough, smart, sensible and well-suited to these rugged island conditions. A stunning addition to this landscape, their mere presence justifies the effort. The introduction of Altamiro promised to be both fascinating and productive and has been well worth the effort." 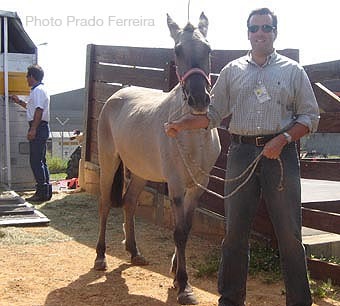 Fernando J. Prado Ferreira, a lawyer in São Paulo, Brazil, is breeding grulla Lusitano horses and has been selecting the best he could find in his country. 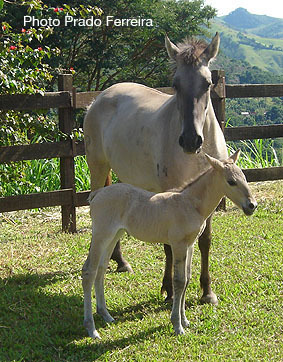 Brazil's Lusitano breeders have bought prime breeding stock in Portugal many years ago, and the Brazilian Lusitanos are among the best in the world by now. It is of particular interest that Fernando Prado Ferreira has a grullo Lusitano stallion that in every way resembles a Sorraia in phenotype. This horse is actually one of the best Sorraia types alive anywhere, and the only difference is in his size. In the summer of 2006, Fernando bought a Sorraia mare in Portugal, Vaiada, to import her to his home country, a mare that was in foal to a Sorraia stallion. She arrived in good shape in November of that year. "This marks the first time since Brazil was a Portuguese colony that a Sorraia was brought back again to this country", Fernando commented proudly. 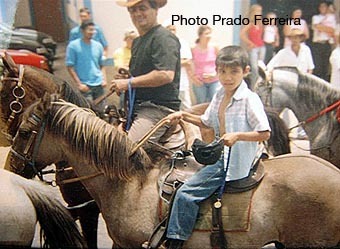 Fernando also found a Brazilian horse, a crioulo, that looked exactly like a Sorraia. Unfortunately, that stallion died recently. 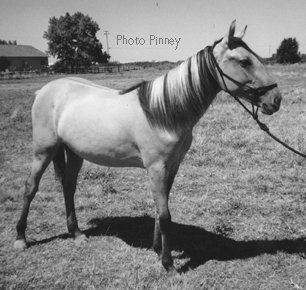 He then located a son of this stallion that looked much like him. The horse wasn't for sale, though. 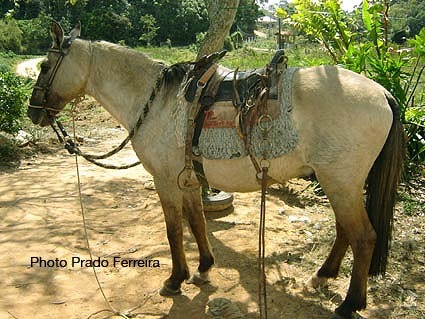 It is a very good cow and ranch horse, the kind that a vaqueiro will not part with.